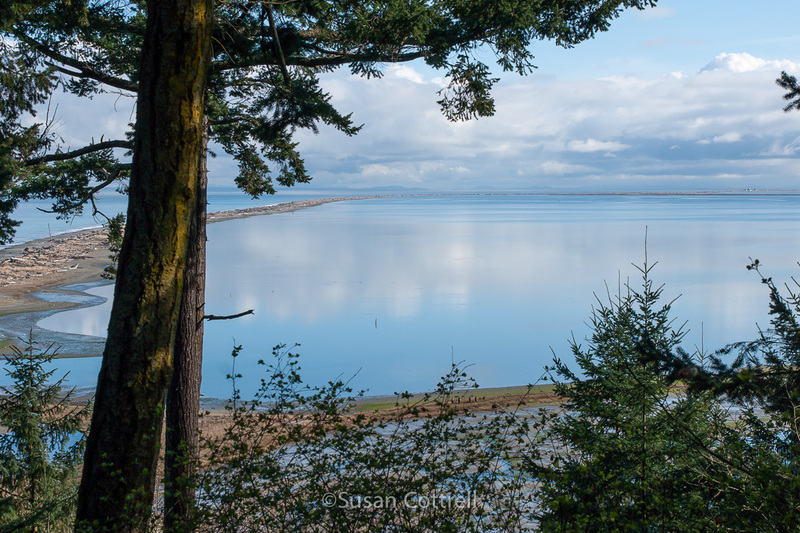 Ahhhh, Dungeness Spit…The graceful curve of this land that stretches out into the Strait Of Juan de Fuca is the longest natural sandspit in the United States. 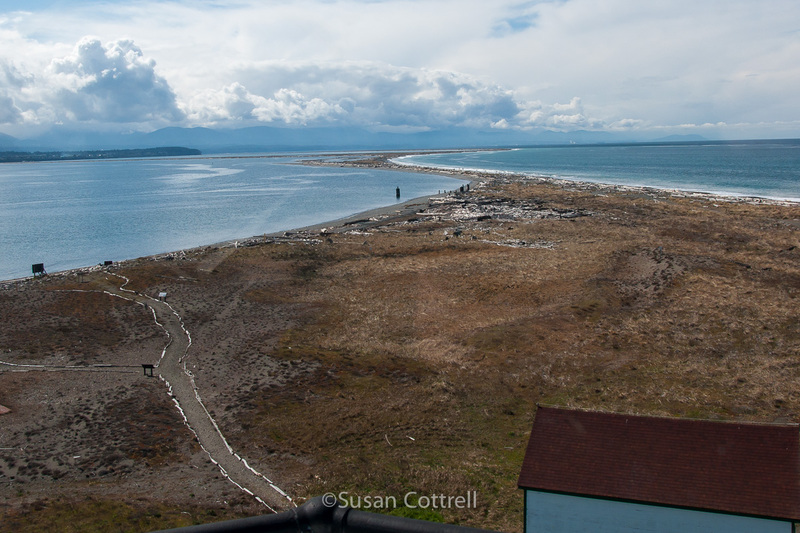 The spit is 5.5 miles long and hiking the full length had been one of my goals for many years. In April of 2012 I finally made the trek with two of my sisters and my daughter. It was every bit as special as my anticipation had built it up to be. There is something about seeing our destination, the lighthouse, as a speck in the distance that made it into something akin to an exploration, a grand adventure. And that is what it became. 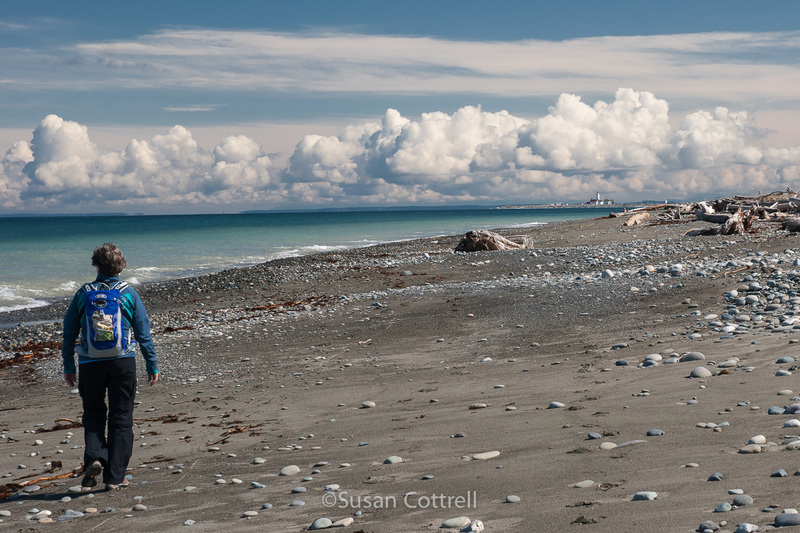 The weather on this day was a beautiful blue sky with dramatic clouds all around. We headed out with the tides in our favor. You do not want to go at high tide as the waves will push you up onto the piled driftwood and that makes slow, difficult walking. The further out we went the more we realized that this was a wilderness of it’s own kind. We were on a tiny strip of land in the middle of the strait. And it is very narrow in places. 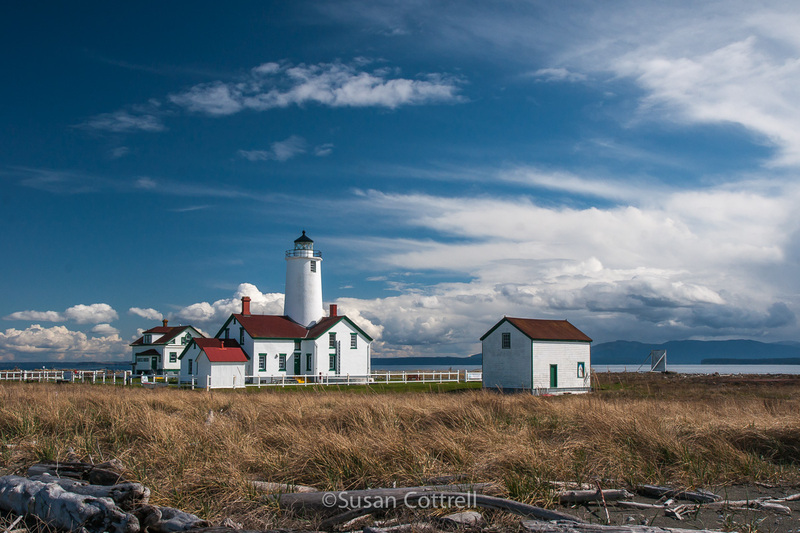 The full force of the ocean is on the west side and Dungeness Harbor is on the east side. 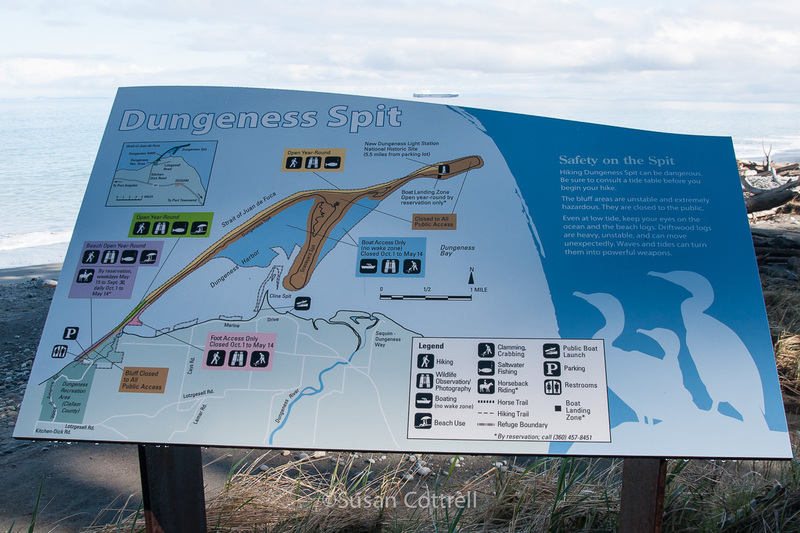 Most of the east side of the spit is protected for wildlife and is closed year round. We reached the lighthouse and the volunteer keepers gave us a tour up to the top. 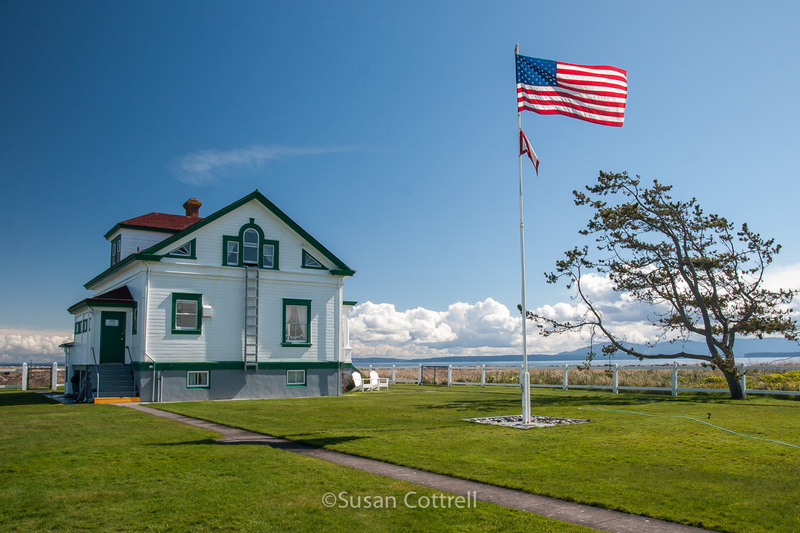 The New Dungeness Light Station Association is a volunteer organization where members can sign up for a week of being the lighthouse keeper. That sounds very intriguing. We marveled at the green grass way out here and after taking the short interpretive trail we headed back. The ocean swell had picked up and the waves were crashing right beside us. 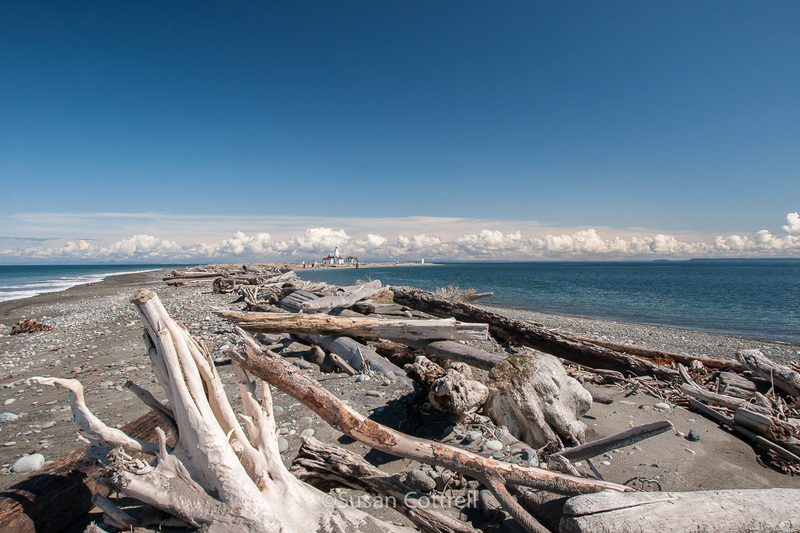 A few times the waves were so close we moved up to the crest of the spit on the driftwood. (OK, this is why you don’t want to be doing this at high tide!) It was exhilarating and made us realize that yes, this is a wilderness. We saw a few shorebirds but this was more of a trek with a destination than an outing to look for birds. We were satisfyingly exhausted when the day was over. Yet another splendid landscape set aside by our forefathers. 14 Oct	This entry was published on October 14, 2015 at 20:56. It’s filed under Birds, Coast, Nature, Pacific Northwest, Sky and clouds and tagged beach, bird, clouds, driftwood, Dungeness Spit, hiking, inspiration, lighthouse, national wildlife refuge, natural history, nature, Olympic Peninsula, refuge, spring, WA, Washington coast, wildlife refuge. Bookmark the permalink. Follow any comments here with the RSS feed for this post.